"The Super 60's," a tribute to America’s favorite "oldies but goodies" band, "The Beach Boys." 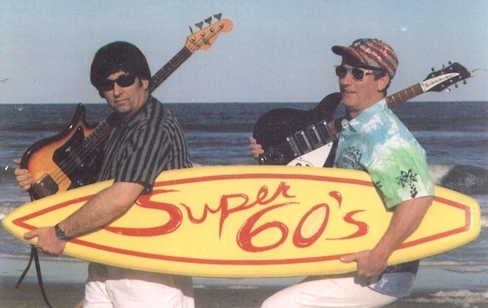 "The Super 60's" features a 2-man impersonation team spotlighting the performances of the two favorite Beach Boys "Brian Wilson" and "Mike Love." They have performed for many national retailers including Wal-Mart, Philip Morris, Regal Cinemas, Volkswagen, Jeep, Chrysler, Mazda and Buick new car dealerships, plus civic and military special events and festivals that include NATO, the Army-Air Force Exchange Service, the Navy Exchange Service, and family fun amusement parks. This show comes complete with performances of many Beach Boys’ classic hits like "409" "Fun, Fun, Fun," "Surfin’ USA," "California Girls," "Sloop John B.," "Barbara Ann," "Help Me Rhonda," "Good Vibrations," "I Get Around" and more! The show is equipped with top-notch professional sound system, eye-catching stage décor featuring the "Surfboard" and racing motifs of hot rods and checkered flags, flame paint jobs, too! As professional "Beach Boys" impersonation performers, they look, sound and act like the real guys "Brian and Mike, " plus they are public relations specialists and have lots of interactive fun with their audiences, repeating sales announcements throughout their shows and conducting emcee duties such as trivia contests and door prize drawings, etc. "The Super 60's" is offered as a 3-hour event, great for corporate parties, retail promotions and festivals. It’s just right for radio remotes, and is also wonderful as a focus for creative ad campaigns in all media.